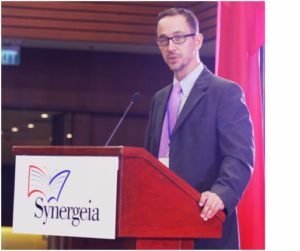 At the 12th National Education Summit, USAID Deputy Mission Director Patrick Wesner welcomed participants and expressed his great honor to address a gathering of stakeholders who work tirelessly to strengthen education governance in the Philippines. “At USAID, we believe that in order to improve the quality of education, we must work together to transform how the education system is governed.” He shared that since 2013, the USAID, Department of Education and Synergeia Foundation have been implementing the Education Governance Effectiveness (EdGE) project which contributes to achieving the shared goal of improving learning outcomes in the Philippines for children in the early grades. This partnership heightened transparency, accountability, and the participation of stakeholders in education policy formulation and implementation. This boosted community engagement by developing School Governing Councils and implementing school improvement plans, further accelerating academic performance in public schools. “I congratulate the hard work and tireless dedication of school governing councils, principals, parents and teachers. Your efforts have improved the learning environment at your schools and provided students with access to a quality education.” He noted that over 2 million children have already benefitted from educational activities, including remedial reading classes and summer reading camps, because cities and municipalities prioritized early-grade literacy and good education governance. “Our theme for this year’s summit is “Bigger, Stronger, Humbler. “Bigger” because we continually strive for the day when all Filipino children will have access to the quality education they need to fulfil their dreams. “Stronger” because deeper commitment and unity across a wide range of partners will make us strong enough to achieve this bigger vision. Lastly, “humbler” because we know that the work is hard, but by humbly learning from each other, we can create synergy to overcome future challenges.” During the summit, Mr. Wesner encouraged everyone to take the opportunity to share ideas with each other on strengthening and sustaining progress within their communities in order to provide children with the best opportunities.